Mexico’s Pacific Treasure offers the opportunity to experience this sport at its very best thanks to the excellent design of its seven courses as well as the magnificent mountains, tropical jungle and beaches that delight golfers. 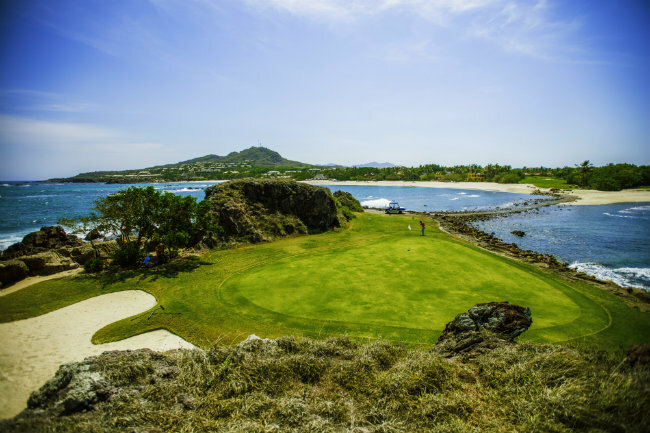 Playing golf on the spectacular courses in Mexico’s Pacific Treasure is one of the top attractions of the destination, this according to the Satisfaction Survey offered by the Riviera Nayarit Convention and Visitors Bureau (CVB). The survey was taken at the end of the first semester of 2017 and visitors—both foreign and domestic—rated this activity with a 9.8. This reinforces golfers’ loyalty to the destination, as international tourists are the biggest group that practices this sport during their stay. 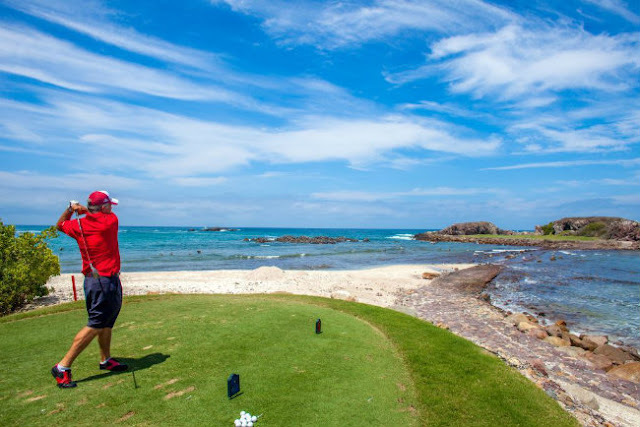 The Riviera Nayarit offers the opportunity to experience this sport at its very best thanks to the excellent design of its seven courses by big names such as Jack Nicklaus, Greg Norman, Jim Lipe, Robert Von Hagge & Baril y Percy Clifford, as well as the magnificent mountains, tropical jungle and beaches that delight the golfers. And, as most of the courses are certified by the PGA—the top North American men’s professional golf circuit—they also have the highest quality services, which contributes to the positioning of the region as one of the best golf destinations in Mexico. Currently golfers can practice their swing on the following courses: El Tigre, Flamingos, Litibú, Vidanta Golf Nicklaus Design Nuevo Vallarta, Vidanta Golf Greg Norman Design, Punta Mita Bahía and Punta Mita Pacífico, this last one home to the famous Hole 3B, also known as the “Tale of the Whale,” the only green in the world on a natural island. Meanwhile, at the Costa Canuva development, located in the northern area of the destination, the first PGA-certified golf course jointly designed by Lorena Ochoa and Greg Norman is currently being built. It will have 18 holes, two with an ocean view and two more parallel to the beach. The Nicklaus Design Course at Vidanta Nuevo Vallarta opened in 2001. This par-70 course has a length of over 6,600 yards. The Norman Signature Golf Course at Vidanta Nuevo Vallarta, which opened in 2016, offers the best in golf with greens and fairways covered entirely in Paspalum. El Tigre Golf Course is one of the most complicated courses in the destination. It was created by Robert Von Hagge and opened in March of 2002; this is a par-72 course with a length of 7,239 yards. This is the oldest golf course in the region and was undoubtedly important for the development of Nuevo Vallarta and Flamingos. It was designed by Percy Clifford and opened in 1970. It’s known for its adequate level of difficulty and its mature design. This 18-hole, par-72 course is considered one of the most challenging in the destination. It was designed by the legendary Greg Norman and covers an area of 7,022 yards; the first seven holes are links, there are eight more in the jungle and the rest are facing the Pacific Ocean. With a length of 7,014 yards, this par-72 course is, without a doubt, one of the most impressive courses in Mexico and, quite possible, the world. It boasts the only green on a natural island: Hole 3B, also known as “Tale of the Whale,” and was designed by Jack Nicklaus. 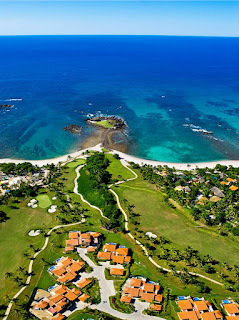 It opened in 1999 and is located inside the Punta Mita development. 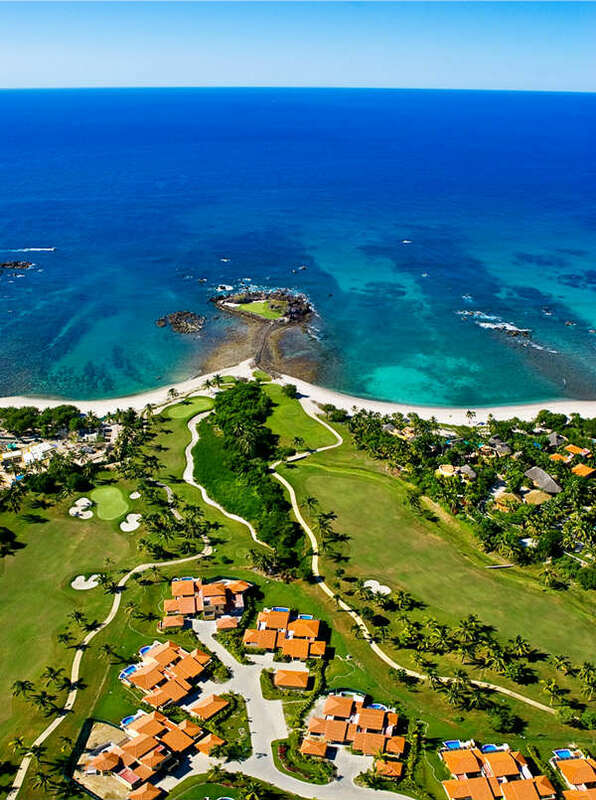 The Punta Mita Bahía Golf Course is the second course in Punta Mita. Designed by Jack Nicklaus, it has 6 holes with an impressive view of the ocean and extends within the development at a length between 5,180 and 7,030 yards.